It's been about a month since I last wrote here. Life has a way of changing direction at any given time. I'm happy to say even if I am not writing - I am doing! I found some interesting tools to tell you about. I may have touched on them previously but as always on the internet - things just keep getting better! More reasons to love Google straight from their labs. Google Trends : Here you can compare the search "trend" (popularity) of up to 5 terms since 2004! 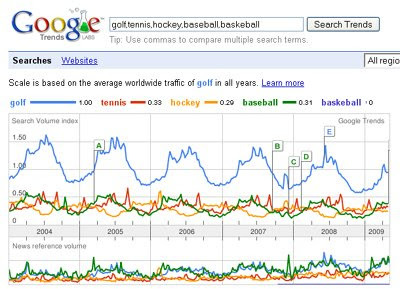 For example - compare what sport is popular with searchers "golf, tennis, hockey, baseball, basketball". Interesting no? Looks like "Golf" (even though it has about the same news coverage) is the sport of choice for internet searchers. May be a good target field to conduct business with :) As a marketer I am interested in the trend of say - my top 5 keywords. Google Insights for Search: While Google Insights for Search and Google Trends use the same data, Insights for Search is geared towards researchers or advertisers who may find some of its advanced reports more useful. Make the best of your Google Adwords campaign by arming yourself with knowledge of the search trends for YOUR product. Yes - I will admit. I love Google (I feel as if I should stand as I say it "My name is Frances and I am a Google lover"). Sorry Yahoo. I tried to make friendly with you - but I found you to be a bit lacking in personality. You don't seem to "know" even a third of the people Google does - and it's all about relationships. You're not clear when communicating with - and you hardly share anything interesting. You may HAVE interesting things to say but...I never seem to hear about it. I have been listening - asking around - no one says much about Yahoo (Other then it's number 2 and Google themselves wants to be their friend). Yes I do have a Yahoo Account too - in case you're wondering.